(ARA) – Want to take an impressive dessert to your next holiday party? Chocolate is a contender but, combine chocolate and hazelnuts and you have a champion. 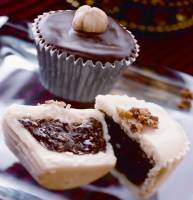 Elegant and delicious Hazelnut Butter Cups will dazzle the crowd. Looking for easy gift ideas for friends, neighbors and co-workers? A selection of Hazelnut Butter Cups in dark and white chocolate is sure to be a hit. They look great in a clear cellophane bag tied with a festive ribbon. They also make excellent homemade hostess and Valentine’s Day gifts! Hazelnut Butter Cups will make it seem as though you have been toiling in the kitchen for days, but they are actually simple to create. All it takes is a little patience to make this delightful hazelnut treat. Beautifully wrapped in alluring chocolate, these treats can be topped with a touch of edible gold dust to complete the package! These are sure to be the star dessert at your next gathering. Preheat oven to 325 degrees F. Stir hazelnuts and liqueur together in medium bowl. Spread onto parchment or foil-lined baking sheet. Bake at 325 degrees F for 15 to 20 minutes until nuts are dry and toasted, stirring occasionally. Cool. Place 10 squares of chocolate and 1/2 stick shaved wax in a microwave-safe bowl. Microwave on high 1 to 1 1/2 minutes, stirring every 20 seconds, until most of chocolate is melted. Do not overheat; chocolate lumps will melt when stirred. Place 1 teaspoon melted chocolate in paper candy cup. Spread chocolate on inside of cup with butter knife, working on 1 cup at a time. Set in cool area until firm, 1 to 2 hours. Place hazelnuts and 1 tablespoon cornstarch in food processor. Process to fine texture (meal), scraping occasionally. Remove 3/4 cup to medium bowl. Add remaining tablespoon cornstarch, confectioner’s sugar, salt and oil to mixture in food processor. Process 5 to 8 minutes until mixture becomes shiny, liquid paste, scraping occasionally. Add to bowl of reserved hazelnut meal; stir until blended. Press 1 teaspoon hazelnut mixture into chocolate coated cup, forming flat top. Place remaining 6 ounces of chocolate and 1/4 bar shaved wax in microwave-safe bowl. Microwave on high 1 to 1 1/2 minutes, stirring every 20 seconds, until just melted. Spread melted chocolate over hazelnut filling to edge of cup, working 1 cup at a time. Garnish tops with whole hazelnuts, chopped nuts or chocolate drizzle. Set in cool area until firm, 1 to 2 hours. Makes about 3 dozen. Prepare as directed above, except substitute cream sherry for hazelnut liqueur and increase confectioner’s sugar to 1/4 cup. Stir in 1/4 cup dried, diced cherries and 3 tablespoons cream sherry. Prepare as directed above, except substitute berry flavored liqueur for hazelnut liqueur, increase confectioner’s sugar to 1/3 cup and do not add cornstarch. Stir in 1/2 cup cocoa. To keep things interesting, try arranging dark, milk, and white chocolate cups on a tray, and vary the toppings a bit. Put whole hazelnuts on some, chopped hazelnuts on others, or use drizzle of chocolate. Don’t limit your creativity — the combinations are endless, like a semi-sweet chocolate bottom, Frangelico crisp inside and white chocolate top. If you plan to give them as gifts, you can add variety to the gift bag with the addition of Hazelnut Cappuccino Cookies. Recipes for these and other hazelnut treats can be found at www.hazelnutcouncil.org.